An unforgettable wine-food pairing experience waits for you at Restaurant Trokay in downtown Truckee. I’m hoping to raid my piggy-bank so I can go again and enjoy the exquisite food and perfectly-paired wines presented by John and Nyna Weatherson at this very classy restaurant. A word to the wise: allow plenty of time for the total experience. Their website, restauranttrokay.com, refers to “superlative customer service” and that is simply an understatement. From the time we were seated for dinner and paired wines until we stood up three hours later, everything was orchestrated to enhance our palate and assure the wine was just right in terms of temperature, presentation and timing. 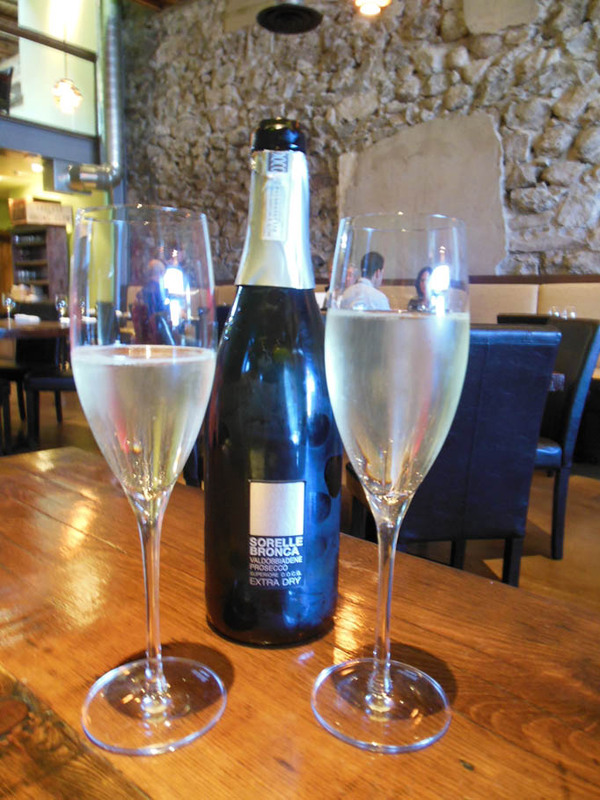 We began with the Italian Prosecco from Sorelle Bronca di Valdobbiadene Superior D.O.C. This extra-dry bubbly had apricot, pear and apple as its predominant flavors, an aroma of pear and apple, and the sweetness and fresh acidity make it delicious by itself or as an appetizer wine. 11 per cent alcohol. $12/glass, $38/bottle. 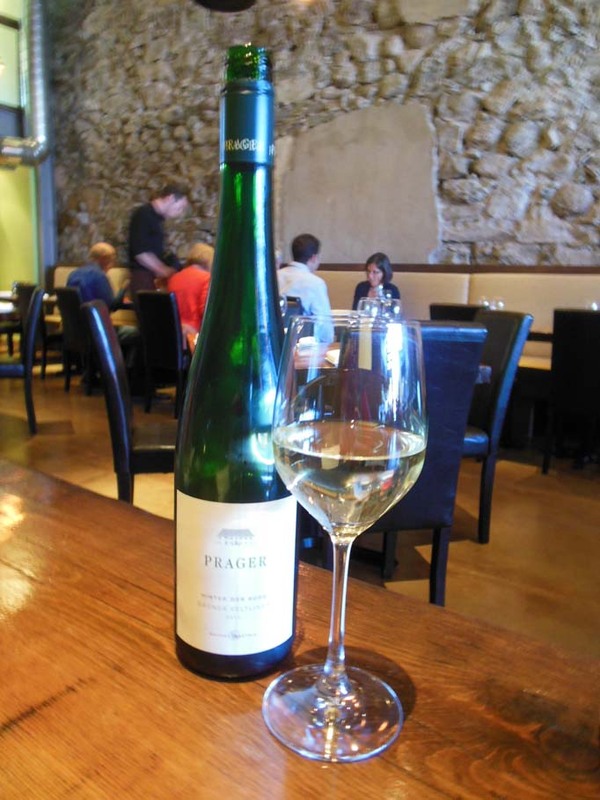 Grunerveltliner is a food-friendly wine, and Trokay makes it a practice to always have one on the wine list. The one we tasted was from Austria, the Prager's 2011 Grüner Veltliner Federspiel Hinter der Burg. The name "Hinter der Burg", which has not been changed since the 13th century according to wine importer WineBow, means behind the old castle Weissenkirchen. Coaxed out of a 7 acre vineyard, this wine has aroma of citrus, spice and green apple, and taste of citrus with a pleasant herbal not and a good minerality. 12.5 per cent alcohol, $67/bottle. Fans of Japanese sake too, the Weatherson’s presented the Rihaku (Dreamy Clouds) Junmai Tokubetsu Nigori Sake. “Aromas of rice and ripe red plums. Bright, mouthwatering acidity leads to a soft and chewy texture from the unfiltered rice particles. The rice flavor is joined by gentle nutty and slightly fruity flavors in the long finish,” notes the winemaker. 15.5 per cent alcohol. The 2010 Sauvignon Blanc from Gamble Family Vineyards in Napa has an aroma that is fresh and inviting, with notes of apricot, green apple and musky melon. The flavor follows on with taste of mango, honeysuckle and candied orange, and layers of citrus and minerality. 13.5 per cent alcohol. $10/glass, $35/bottle. 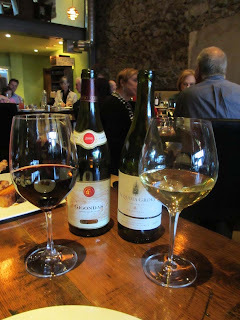 One of my favorite wines are those from the Languedoc region of France, and here at Trokay I tasted the 2012 Domaine de Nizas Rose blend of Grenache, Syrah and Mourvedre. Delicious. It is lush and lively, with aroma of strawberry, raspberry and spice. Additional flavors of melon, orange zest, and a crisp and medium body. 14 per cent alcohol. $10/glass, $37/bottle. The tasting and food pairing went on and on… as it should in a fine dining restaurant. Other wines we tasted were the 2009 E. Guigal Gigondas , a Rhone blend of a blend of 65% Grenache, 25% Mourvèdre, and 5% Syrah; the 2011 Chardonnay from Sequoia Grove, Napa; and the final touch was the 2010 Donnafugata Ben Rye Passito di Pantelleria, a sweet wine from Sicily. 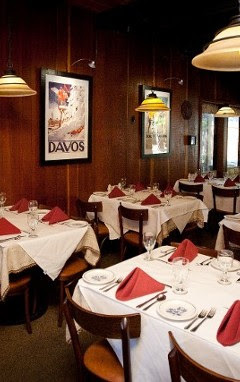 Restaurant Trokay is located at 10046 Donner Pass Road, Truckee. No reservations required at their wine bar, but for the full dining-wine experience, reserve at 530 582 1040. La Fondue in Incline Village concentrates on fondue of all kinds: cheese, meat and vegetables, chocolate with fruit. A leisurely meal is guaranteed when you go to La Fondue, so enjoy a glass of wine while the cheese or the oil comes to temperature before the on-table-with-fondue-sticks cooking can begin. 2010 White Zinfandel, Beringer, Napa. From the Beringer White Zinfandel bottle: “Since 1876, Beringer has crafted award-winning wines in Napa Valley and this White Zinfandel is no exception. Crisp and refreshing, bursting with the aromas and flavors of fresh fruit, America’s favorite White Zinfandel is well suited on its own or as the perfect complement to a meal.” Light rose in color, with a light and bright aroma, and a sweet taste, this wine is good for summer sipping. $6/glass. 2010 Pinot Grigio, Columbia Crest, Washington State. Very golden in color, the aroma is fruity and floral, and the taste is crisp and light with some apple notes. $8/glass. 2010 Sauvignon Blanc, Nobilo, New Zealand. The winemaker notes: “Pale yellow with brilliant clarity. Very evident aromas of pineapple, passion fruit and melon. Fresh, crisp and clean with zesty flavors of ripe tropical fruits and zingy acidity. A beautifully balanced wine with great presence and mouthfeel.” This mouthwatering classic from New Zealand has hints of herbs and flowers. 14 percent alcohol. $9/glass. 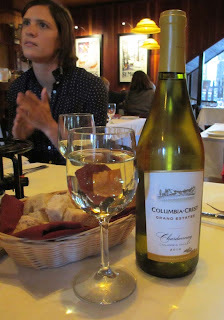 2010 Chardonnay, Columbia Crest, Washington State. This is a light chardonnay, with a bit of semillon and Sauvignon Blanc blended in to add to the freshness and vibrancy. Aroma of apple and pear, a touch of coconut too, and flavor of orchard fruits with citrus and a bit of oakiness. It is juicy and crisp. 13 percent alcohol. $8/glass. 2010 Pinot Noir, Byron, Santa Barbara. This wine features flavors of black cherry, plum, and cola, and is bright and intense. 2010 was a cool vintage in Santa Barbara, and the Byron Pinot Noir reflects that with a fruity finish. Spice and vanilla are also nice flavor notes. $10/glass. And last but not least, one of my favorites, sold here by the bottle: The Prisoner, 2010, Napa, is primarily a blend featuring Zinfandel (44 percent) and Cabernet Sauvignon (26 percent) and several other red grapes. Aroma of cherry and cedar, and taste of dark fruits and currant. Nicely tannic, and still high alcohol, but so yummy! $65/bottle. 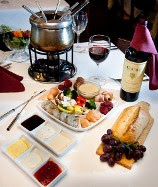 La Fondue is located at 120 Country Club Dr Incline Village, NV 89451. One of my favorite summer wines are Vinho Verde wines from Portugal. This wine comes to mind when you say “Wines of Portugal” to most winelovers… well, that and Port of course. The recent San Francisco tasting of Wines of Portugal showcased many wonderful wines. They are all fresh, drinkable and for the most part well-priced. The Vinho Verde region includes the coastal area on the Northwest corner of Portugal, between the Minho and the Douro rivers, and features many indigenous grape varieties. There are red Vinho Verde and white Vinho Verde wines. For summer, try the whites. The Aveleda Vinho Verde is a blend of 4 white grapes, and is citrus colored and flavored, young and well-balanced with a smooth and delicate bouquet, and the taste reveals hints of fresh fruit. When you taste Vinho Verde, no matter the producer, you’ll find it fresh and vibrant. The Aveleda Vinho Verde is distributed in 46 states. 10 per cent alcohol! Retail price is 8 or 9 dollars/ bottle. Ela Vinho Verde 2012 is a medium dry blend of predominantly Loureiro, with Trajadur and Arinto too. it is a light, floral and fruity wine with lemony flavors and is slightly sparkling. There’s the taste of citrus, not too sweet, and an aroma of fruit when you open the bottle. 10 per cent alcohol. $10/bottle. Look on www.touchstone-wines.com to find nearby sellers. Alianca Vinho Verde 2012 is light bodied and light colored. It has a nice crisp taste, cirtusy and a bit tart. 10 percent alcohol. $8.99/bottle. 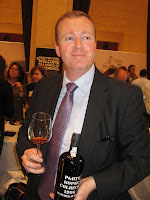 In the Port category, the Late Bottled Vintage 2007 from Sogrape is a blend of ports from the last ten years. It is lighter tasting than many ports, more approachable at an early date, less oxidative in taste, and less nutty. In many ways, this is opposite of a tawny port. 20.5 percent alcohol. $24.99/ bottle. The Kopke Colheita 1996 Single Harvest Tawny Port has that lovely caramel and dried-fruits and nuts flavor we like from a tawny port. Average price on the internet is $36/bottle. My own house port is the Six Grapes Reserve Port from Graham’s. It is fruity and robust. Bottled young (after 3 to 4 years), it has characteristics similar to a young Vintage Port. Because of its price point ($20-22/bottle) and because I am not a wine snob, I’ve never found it necessary to decant this port. 20 per cent alcohol. 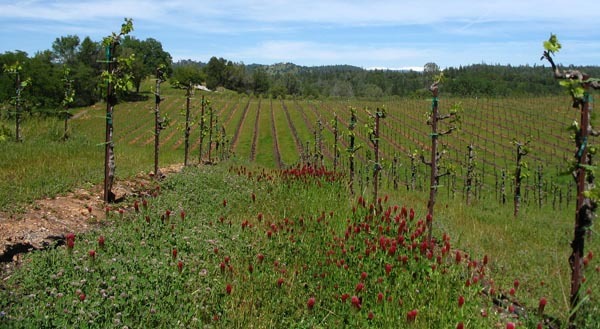 Elizabeth Standeven and her husband Andrew grow Barbera, Primitivo and five Portuguese winegrape varietals on seven acres of vineyard in a prime location at 1500 feet elevation in El Dorado County. They are like many small farmers: time-challenged. It was difficult for Elizabeth to find 15 minutes to update me on the state of her vineyard, which actually reflects the status of many vineyards nearby in El Dorado County, California. Elizabeth, however, does take her position as President of the El Dorado Wine Grape Growers Association seriously, and any bits of awareness she can garner for El Dorado grapes has moved closer to the top of her multi-layered priority list. Other tasks on her list? Then there is the need for labor. Elizabeth and Andrew try to do as much work as possible themselves on their 7 acres. At that size of vineyard, she notes, you can’t make any money unless you do some of the work yourself. “Unless you have a winery as well as a vineyard, it doesn’t pay to hire lots of labor. 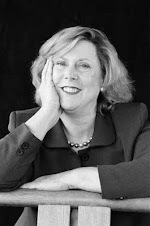 The truth is that who performs the tasks is very dependent on the size of the vineyard,” she said. This year, as in past years, with the tight window of time to thin Barbera shoots, Elizabeth turned to her labor contractor to supply help. Her vineyard, Shaker Ridge, needed 100 to 120 hours of work to be done in 2 to 3 days time. But this year, labor was tight. Her contractor turned her down and she was scrambling to find help. “I don’t know what is more stressful, trying to do the work yourself, or trying to find help,” she said with exasperation. Finally their contractor sent some laborers to help finish the job, but Elizabeth and Andrew had already put in 60 hours between them on a beautiful spring weekend. Their daughter busied herself with schoolwork. Providing high quality grapes to wineries in El Dorado County and elsewhere has been the role of small winegrape growers, and that isn’t changing very fast. New farmers come into the Sierra Foothills every year to grow winegrapes, largely because they want to get out of the corporate rat race and to be close to the land. Over half of the 70 members of the El Dorado Wine Grape Growers Association farm fewer than 10 acres. In the more remote areas of El Dorado County where so many small vineyards are located, labor will continue to be a concern. “In the Apple Hill area, where there are a dozen vineyards within a mile of each other, or in the Fair Play AVA, it’s possible to pool labor efficiently with the labor contractors. But so many of our members are all by themselves, farming a few acres in challenging terrain,” Elizabeth noted. It is worth the effort. The grapes that these small farmers grow have intense flavor, gorgeous color, and are used to produce the delicious wines that are garnering Sierra Foothill wines more and more awards and recognition. The buzz in the wine business is palpable. 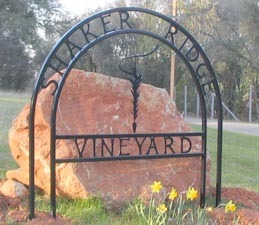 As to Shaker Ridge Vineyard, located up mountain in the little town of El Dorado, population about 4500, Elizabeth and Andrew are now in their 11thleaf. They bought vacant land, prepped it, and planted their vines in 2002. Now in their mid-forties, the former molecular anthropologist and her husband the toxicologist have no regrets. Will their elementary school daughter see farming as a career too? It’s always a privilege to tour the Pine Lodge, showcase of the Hellman-Ehrman Estate at Sugar Pine Point State Park, and even more so to sit on the historic front porch sipping good wines from Tahoe Ridge Winery and hearing the wisdom of Mark Twain presented by McAvoy Layne. You can do this too, on August 30, when the Sierra State Parks Foundation hosts its next “Evening of Wine and Wisdom.” This is a fundraiser for the Foundation, and well worth your time and money. Bring your wine palate too and enjoy the wines! Tahoe Ridge Winery, located in Minden NV, was the wine host in July, and they poured a selection of wonderfully crafted wines. I started with a taste of the 2009 Reserve Zinfandel, California. This classic Zinfandel is made from California grapes, and delivers everything you’d expect: flavors of strawberry jam, cherries, a hint of cinnamon, a touch of cedar, and earthy tones of tobacco and leather. You’ll definitely want to sit on the porch when you drink this, as alcohol is at 17.2 percent. At the winery, cost is $46/bottle for the 2008 vintage. Those of us at Pine Lodge got a sneak peak at this newest vintage of the Reserve Zinfandel. The 2011 Sauvignon Blanc is also made from California grapes. A citrusy aroma leads to flavors of green apple, lime and tangerine. 15.2 percent alcohol. $22/bottle for the 2008 vintage. The 2010 Reserve Chardonnay featured flavor of ripe apple and peach, a classic California Chardonnay profile. Again, we got a sneak peak at the newest vintage of the Reserve Chardonnay. 13 percent alcohol. $29/bottle for the 2009 vintage. The 2008 Reserve Petit Verdot is also a tasting sit-while-you-sip wine. 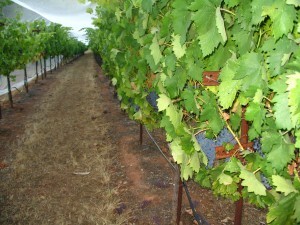 Although Petit Verdot is best known as a blending grape with other red Bordeaux varietals, it is flavorful on its own. This wine exhibits classic flavor of dense dark fruit, like black plum. 17.2 percent alcohol. $31/bottle, available only at the Bistro associated with the winery. Tahoe Ridge wines are made in Nevada. Wines made from selected grapes sourced primarily in California include Merlot, Barbera, Cabernet Franc, Petite Sirah, Semillon and Muscat Blanc. Wines made from Nevada grapes include Frontenac, and La Crosse. Tahoe Ridge Winery Bistro and Marketplace is located at 1644 Highway 395 in Minden, NV. (775) 783-1566. Sugar Pine Point State Park lies along the west shore of Lake Tahoe, about ten miles south of Tahoe City on Highway 89. This information first appeared in The Tahoe Weekly newspaper, where I write the Wine Time column, on July 11 2013. The 8th Annual Tahoe City Wine Walk presented tourists and locals a chance to taste wines from regional California wine producers as they sashayed the streets of downtown Tahoe City on a nice summer day. This fundraiser for the Tahoe City Downtown Association attracts great wineries and hundreds of wine lovers. I started my tasting tour at Tahoe Mountain Brewing Company, where they poured a 2011 Chardonnay, Main Street Winery, St Helena, CA with grapes sourced from Santa Barbara County. The result is a wine with aroma of pear and tropical fruit, and taste of melon, lemon and apple, a hint of toasted almonds. It’s a nicely balanced and creamy wine, with a bit of spice. 13.5 percent alcohol. It’s on the wine list at Tahoe Mountain Brewing Company for $6 the glass. Bogle’s 2011 Merlot is a crowd-pleaser, and widely available. Alpenglow Sports hosted this winery, and lines were long to sample this well-known wine. Cherry cola is the dominant flavor, with currant and fig mingling with a pleasant herbal nature. It has a smooth and lovely mouthfeel. 13.5 per cent alcohol. Internet prices as low as $10/bottle! Now, that’s a sweet spot for the summer!